I’ve never been interested much in guns. I grew up around them and they never much impressed me. I learned how to fire a rifle at a very young age, and had a hunting license by the time I was in the fifth grade, but in the interest of full disclosure – our whole school got them, otherwise the area schools couldn’t close on the first days of Turkey, Buck and Doe seasons. The point is I was watching R. Lee Ermey’s Mail Call Civil War Special and I saw something that made me sit up and take notice – and nearly pee my pants. 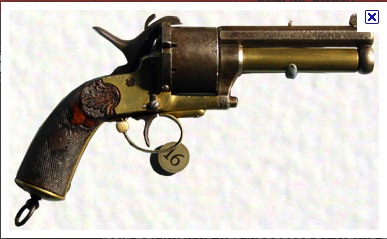 The 4 pound LeMat Confederate Cavalry double-barreled “Grapeshot” Revolver. What caught my eye was the second, lower barrel – a shotgun barrel designed to fire buckshot/grapeshot in addition to the 9 bullets of the Revolver. As I researched the LeMat Revolver, I came to learn that LeMat married P.G.T. Beauregard’s cousin! I wish I could recall where I read that so I could credit them… But I read so many articles I lost track. However, I did manage to bookmark two of the better write-ups and I encourage you to visit them to learn more about this amazing piece of Civil War Weaponry. NRVO Fighting Iron: LeMat’s Revolver is simply OUTSTANDING and if you are into technical information johno.myiglou.com’s LeMat Revolver is well written. SOURCE: The photo was taken from Curator’s Corner from Tulsa on nrablog.com and was used without permission. ~ Thank you very sincerely for visiting my blog. I would like to extend a very cordial invitation for you to take a look at The American Civil War Chronicles home page and read some of my other posts…. If you could message me with a few hints on how you made this website look this cool , I would appreciate it! The theme is Quentin, and the background is a William Morris wallpaper print.